When my non NY/New England friends hear the word camp, they think I'm talking about the place kids go to stay for a few weeks each summer. But up here, we call that a summer camp. That's where kids go. A camp (excluding the word summer), is a home. A rustic retreat. In Florida, it would be called a Lake House or Beach House. In Michigan, it's a Cottage. Other areas might just call it a Summer Home. Here in the Adirondacks, it's a Camp. Typically camps are only used in the summer months. But many are semi or fully converted to use in the fall and winter too, either for a ski lodge or a hunting lodge. We have a long and really wonderful history with camps. There is even a sub-category referred to as The Great Camps, referring to the grand and luxurious camps used by the rich and famous such as the Rockefellers and Vanderbilts. Many were also owned by Jewish families, who were snubbed from other more popular areas at the time. 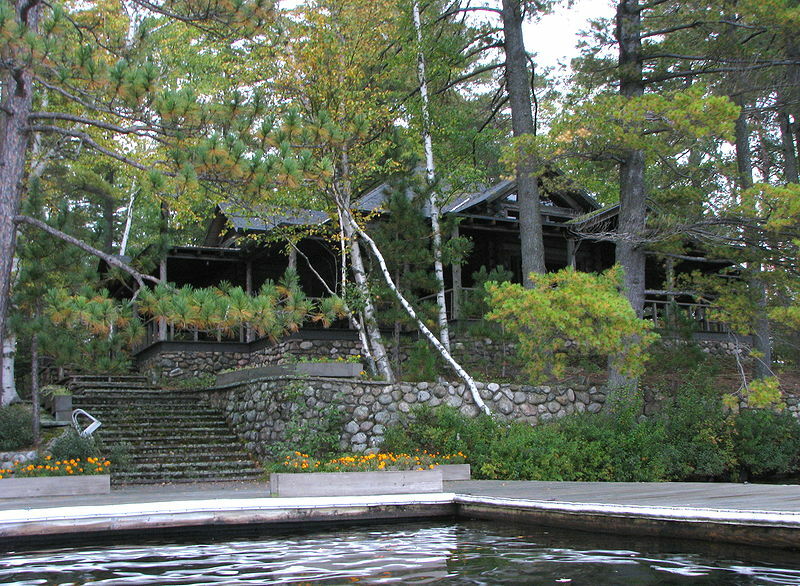 These still famously designed homes are an important part of our culture and local economy. Families flock to Lake George and other surrounding lakes to get away from the hustle and bustle of life for our precious 12 weeks of summer. Regardless of size, and it should be noted that most are very modest, often just two rooms but with a great mountain or lake view, camps all have names. All of them. Owners spend a lot of time coming up with a name that fits the camp. And old historic camps, like the ones I've linked to here, keep their names for a lifetime. You could never change a camp name given by a Vanderbilt! I seriously have THE PERFECT camp name picked out, should I ever be lucky enough to own one. I'll never tell unless it comes to fruition. But trust me...it's so cute! 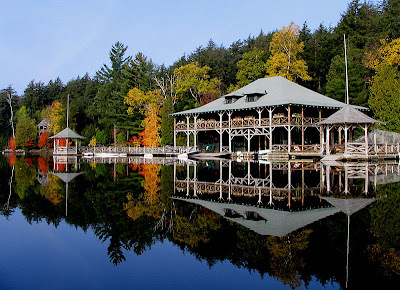 Many of the large and grandiose camps have been sold and are now used as...well as camps. But more along the lines of a Bed and Breakfast. They rent rooms or cottages on the property out to families coming to stay for a week or month at one of the lakes. Last weekend I went to Camp Wiawaka for my Junior League board retreat. Being up on Lake George brought back so many wonderful childhood memories. I really need to get up there more often! 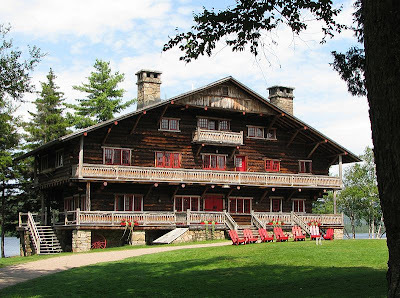 Have you ever been to an Adirondack camp? What do you call a camp in your part of the country? It's a camp here in W. PA too. I loved Lake George when we were there, so pretty! I always think of "Dirty Dancing" when I think of the Jewish camps in the Adirondacks and the Catskills. B's family has summer and winter camps up on Great Wolf Lake. That's where she got married...it was beautiful! As you said, it's cottages or cabins here in Michigan. 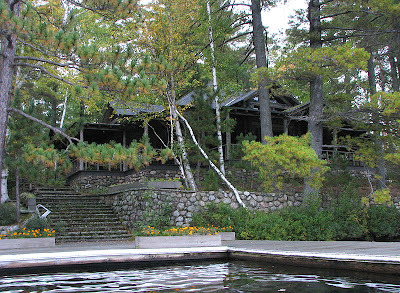 Cottages tend to be of the slightly "fancier" variety and cabins are more rustic. Regardless, they're wonderful places to escape. Leaving tomorrow night and can't wait!!! Our cottage growing up was Recess as my parents are both teachers. The owners do change the names of the cottages to reflect the current ownership so the new owners now call our old cottage Berles's Court (huge tennis playing family).